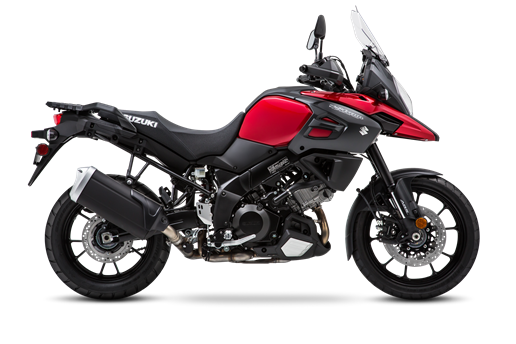 Sturdy chassis has integrated mounting points for unified Suzuki V-Strom accessory luggage that’s easy to clip on and off, and keeps the motorcycle trim when ready for touring. Suzuki debuted its first motorcycle Traction Control System* on the 2014 V-Strom 1000, and a new-generation system is employed on the 2019 V-Strom 1000. Suzuki’s Traction Control System lets the rider control the throttle with more confidence in a variety of riding conditions. • The Traction Control System continuously monitors front and rear wheel speeds, throttle opening, engine speed, and transmission gear. It quickly reduces engine output when it detects wheel spin by adjusting ignition timing and air delivery. • The rider can select one of three modes (1, 2, and OFF). Modes 1 and 2 differ in terms of sensitivity. Mode 1 has lower sensitivity; it allows a certain degree of rear wheel spin for good road conditions. Mode 2 has higher sensitivity; the system engages traction control sooner and is for poor road conditions.